There is almost universal agreement that the Internet of Things (IoT) is set to become the next 'big thing' for the enterprise. But no one knows exactly when that long-awaited transformation will actually happen. The core idea behind the IoT is simple: Connecting the physical world to the Internet enables objects to become 'smart,' giving us far greater control over our physical environments. Armed with this intelligence, enterprises will reap benefits in the form of more efficient and reliable systems - along with a wide range of new and enhanced business models that support connected products. By tightly integrating the physical and digital worlds, it will be possible to create structures that can be managed together as a single, cohesive system. In short, the prospect of virtualizing the assets of the physical world and connecting them through the Internet offers dramatic transformational potential. Such a transformation can radically affect nearly every type of enterprise - from agriculture to manufacturing - while simultaneously opening the doors to new experiences and conveniences in the consumer market. But is the IoT story that simple? Even as the level of hype and interest in IoT nears peak levels, concerns about the disruption and costs associated with it are holding back widespread enterprise adoption. 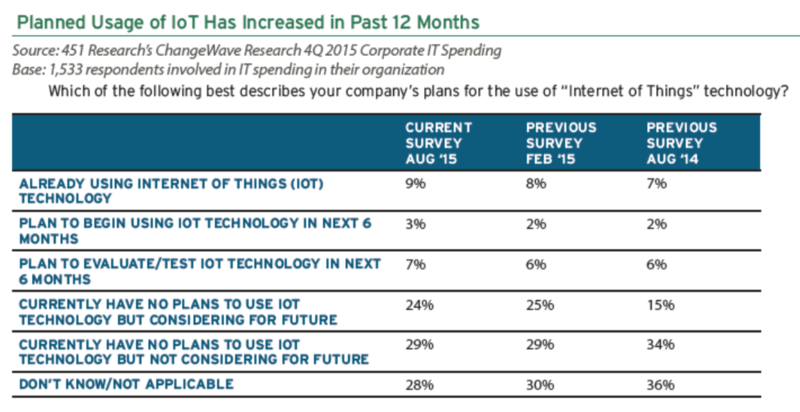 In other words, despite the hype and potential, IoT is still in its early stages. The figure below presents the results of three separate 451 Research surveys related to corporate IoT adoption that were conducted over a 12-month period. As these results show, while there's been a small uptick in adoption quarter to quarter, IoT is still just a minor blip on the enterprise IT radar. The majority of respondents report their organizations are either simply considering it or not planning to use IoT at all. These results are symptomatic of a market in desperate need of education about not only how IoT should be deployed, but more importantly, why now? The immediate answer: As IoT technologies become more prevalent in the enterprise, the savviest organizations will rapidly learn how to manage this transition as smoothly as possible. Start planning for the IoT now. IoT will be disruptive to nearly every industry. CXOs need to be asking what is possible with the IoT - their competitors certainly will be. While the majority of enterprises have not yet added IoT to their strategic planning processes, that is likely to change rapidly. 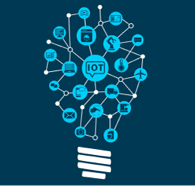 Create a business context for IoT. The challenge for vendors will be to educate potential customers on what is possible with the IoT from a business context. This requires articulating the business value of IoT and providing the proper context for how the digital transformation of data can give customers a leg up on the competition. Avoid pitfalls. Successful enterprise deployment of the IoT requires solving the business process challenges associated with its adoption - rather than those of its individual technology components such as connectivity or bandwidth. Look for vendors that can put IoT into the proper business context and can transform digital data into business insights. Avoid offerings that are focused on a single IoT technology. The generally accepted vision of the IoT boils down to the transformation of entire industries - through unprecedented connectedness on a massive scale.